Jim Massey’s Cleaners and Laundry, of Montgomery Alabama were looking to eliminate their high costs of hot water and chemicals used in their textile and garment restoration department. John Massey provided proof of the effectiveness and payback by using EcoTex Cold-Water Disinfection Systems on his washers. Engineered and manufactured by California based ClearWater Tech, EcoTex was first introduced to John Massey by Eastern Regional Sales Manager, Skip Mallios who told John just how much of a difference a proper injection of ozone would make with the wash processes in his plant. John agreed with the thought of SAVING hot water, speeding up formulas, and reducing chemistry primarily to wash garments and textiles damaged by fire, smoke, water or infected by mold and other contaminants. 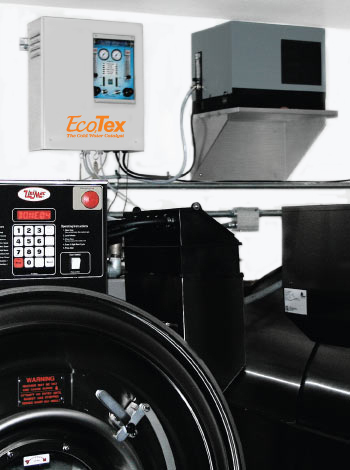 Skip installed an ECO2 ozone system on two of their 60 lb., UniMac commercial washers for a period of 30 days. After that time, management could evaluate the results and document the differences in quality, reduced hot water, chemical reduction, and run times compared to their normal laundry procedures. To learn how you can save with EcoTex, contact ClearWater Tech today. Headquartered in San Luis Obispo, CA, ClearWater Tech, LLC is a leading designer and manufacturer of ozone systems for water and air purification. Since 1986, ClearWater Tech has earned distinction for technically advanced ozone generation applications, and thousands of installations worldwide.